Repair Your Word File Online Now! Supports to Retrieve Word file with Macro, Word with Restricted Editing etc. 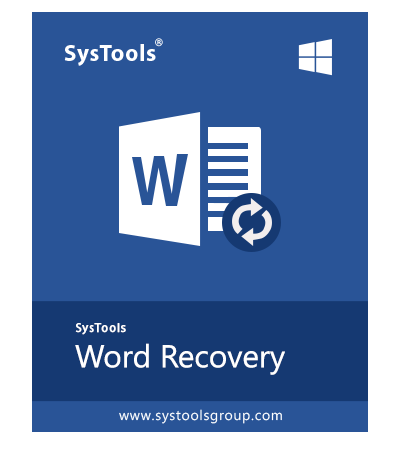 SysTools Word Recovery software is just an amazing utility to recover corrupt MS Word files in just a few clicks. The tool is integrated with numerous features which makes easy for the user to recover and view the Word document with all the formatting maintained. Thank You so Much SysTools. This is the best word document recovery software I have ever used. It helped me repair damaged word file with different Word recovery Modes. 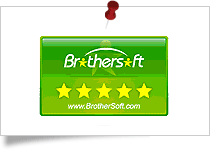 Its a worthwhile Word Repair Software. I want to recover one of my MS Word files embedded with online images, videos, charts, shapes etc. But I was not able to find out a utility using which I can complete this task. Then one of my friends suggested me an instant and reliable utility i.e. SysTools Word Recovery Tool. This MS Word repair tool just worked like magic I was able to recover my Word file and all the formatting, layout, fonts etc. were maintained by tool. Thanks for developing such a brilliant utility. How you can Fix Damaged or Corrupted Word Files ? Can't Repair Word Documents ? Word cannot open the document. What can you Recover from Word Document ? With Word Recovery tool, you easily recover corrupt Word files and repair Word document in bulk with File & Folder Mode. Repair Single Word File: Use File Mode to restore single Word file with the help of Word Recovery utility. You can also fix corrupted word file in bulk in a one go using Ctrl keys. This Word Document Recovery allows users to select multiple Word files at once & repair corrupted Word file. Recover Folder Containing Word Files: Select complete folder containing Word files with Folder Mode option & recover them in just one go. Auto-Detect Word File & Fix:The word file recovery tool also auto-detects the drives present in the system. The user can select the specific drive from the list of drives and then he/she can repair the Word file. Additionally, the utility also offers the option to search Word files present in the subfolders. Word Recovery Tool allows users to repair corrupt Microsoft Word file with formatting, fonts, layout etc, without installation of MS Office. You can recover a severely corrupted Word file irrespective of the reason of its corruption. This MS Word repair tool is designed with advanced algorithms to recover corrupt word document and integrated with numerous features alongwith preview modes of the Word file which helps to recover images from a severely corrupt MS Word document. The Word file recovery software is basically, a combination of three major steps : scan, analyze, preview. First, the user needs to add corrupt MS Word file into the Word Repair Software then the software will repair Word file. Finally, the user can easily preview the Word file alongwith facility to Print, Zoom in, Zoom Out, Different Page View Options like 100% View, Page Width, Whole Page, Two Pages directly from the software dashboard & recover with Word File complete data & actual format after recovery. The Word Recovery software provides Add File option with two different Word file adding modes that are: File Mode and Folder Mode. File Mode : If the user wants to repair a single word document file then he/she can easily make use of file mode. Apart from this, the user can also recover multiple MS Word file at once with the help of file mode option. Folder Mode With Folder mode option, the user can recover all Word files present in the folder in one go. The user just has to select the folder containing the MS Word files. Sometimes, the user is not able to find out the location of Word file then in such situation Auto-Detect feature provided by the Word Recovery Tool works. The software first auto detects the drives present in the system. Then the user can select the particular drive and can view the Word files respectively. Rich Text Mode: This mode shows preview with formatting like fonts, layout, header, footer, clipart, graphic , embedded Pictures, Online Pictures, Shapes, Icons, 3D Models, Smart Art Charts, Tables, OLE Objects, Online Video, Comments in Word, Hyperlinks etc. Plain Text Mode: This mode allows the user to view only the text present in the Word file without formatting. Moreover, after recovery, the user can save the file in the DOCX file format. Free Trial / Demo version of Word Repair software only preview recovered data from corrupt Word file. How to fix a Word Document that is corrupted ? Can this Word Recovery software recover data from my virus hit Word file? What can I do to try to recover part of a corrupted Microsoft Office document file? I am currently using MS Office Word 2013 & suddenly my file Word crashed. I am not sure if My word file is corrupted how to recover corrupt word document ? Word repair tool is an excellent tool for Word Document recovery and works for all corruption issues that occur due to any malware or virus attack. How many Word files can the Word repair tool recover at once? I need to recover around 50+ MS Word files in one go. Is there any Word Repair Software using which I can recover Word files in bulk? 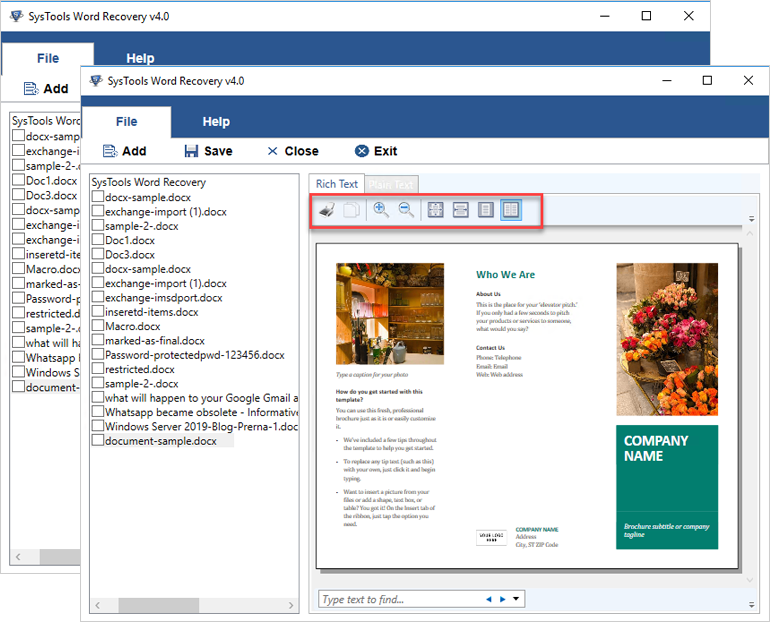 Yes, Word Recovery tool allows the user to select multiple Word files individually with Add File mode / Add complete Folder and then, recover them in just one go. Will this Word Repair Software help me resolve Word file error messages too? While accessing one of my DOCX files, I am getting this error 'File cannot be accessed'. Will the software still be able to recovery the document? 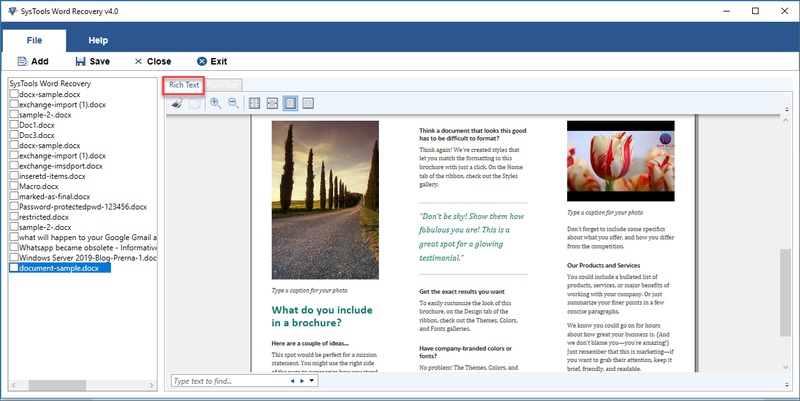 Please try demo version of the tool to repair Word File and evaluate result before purchasing the full version. Is this Word Recovery Software compatible with Windows 10 OS? Yes, this Word repair tool can now be used on Windows 10 PC easily. It supports all latest as well as older versions of Windows. Can I recover a Word file embedded with images/pictures and videos in it with this software? I am having a Word files with various pictures and videos embedded in it. Actually, I want to recover that Word file as my professor told me this file is corrupt. So, please suggest me a reliable and instant way to recover Word file embedded with pictures and videos with all formatting maintained. Yes, with Word Recovery software you can easily recover and view Word file embedded with pictures and videos via the Rich Text mode. Can the tool recover microsoft office document without MS Office installed on machine? 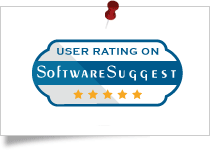 Yes, this Word Repair Software is completely independent and works even without MS Office installation. Hence, you can be use the tool successfully even if MS Office is not installed on your PC. But , inorder to preview the file, MS Office installation is necessary. Is an MS Office 2013 document recoverable with your tool? Is there any formatting issues associated with the resultant Word file? No, there are no formatting issues associated with the Word file even after the recovery process. Does the tool auto-detects the location of MS Word file present in the system? I want to recover my Word file but I am not able to find the location of that Word file as one of my ex-employee saved it on the system. Is there any tool using which I can find the location of the Word file and recover it? Yes, the software auto-detects the location of MS Word file present the user’s system. The user can easily view the Word file from the specific drive and can recover it. Not only did the Word Recovery Tool offer a successfully accurate recovery procedure for my Doc files, but also worked very smooth with no complications to repair word document. The simplicity of Word Recovery Tool is one of its best aspects which make it absolutely worth trying once!. The bulk recovery mode offered by Word Recovery software is something I liked most about it. It was quite convenient to repair Word File with convenience yet save it back in healthy format with the same convenience too. Thanks to the developers for keeping all user needs in mind. 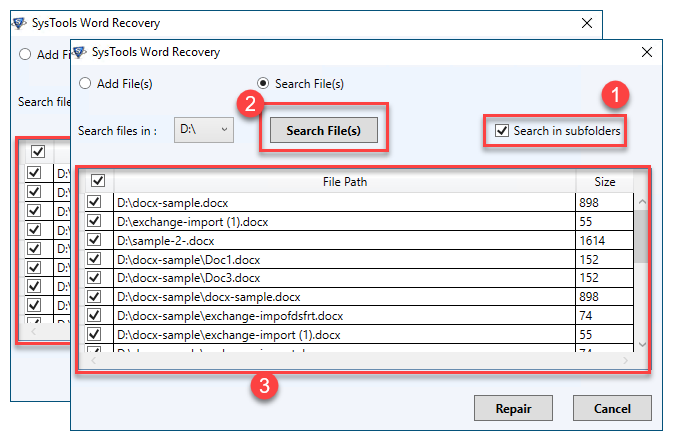 Browse Word File(s) , Folder or Search within Drive for recovery process to repair Word File. Save file in destination path where user need to place recovered file.